Are you a yoga teacher, therapist, life coach, guide, actors, doctors, social worker, healer, or teachers who wish to perform better in your profession with less struggle and strain? Do you wish to live more meaningful life with positive energy, mental clarity and carrying the attitude serving others? 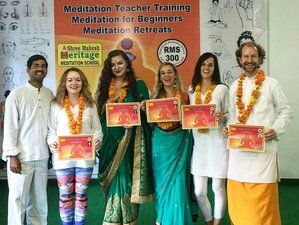 Shree Mahesh Heritage Meditation School, from the foothills of Himalaya, Tapovan Rishikesh, India will introduce a short-term meditation teacher training certification course for the beginner level of meditation practitioners. Let Shree Mahesh Heritage teach you how to guide the others and make you become a loving, caring and compassionate person. You will be staying in a budget hotel accommodation room. This program is designed to offer multi-style meditation techniques teaching and the trainers, in-depth knowledge sharing to the beginner and intermediate meditation practitioners. The program will cover yoga meditation postures, hands gestures, breathing techniques for balancing energy and chakra, yoga meditation philosophy, sacred Beej mantra chants, and teaching methodology skills. You will have an opportunity to learn, experience, and be inspired by the meditation masters and your senior fellow trainees of 300 hours of meditation teacher training participants and a combined certification ceremony celebration after completion of the course. Full course attendance is required to be eligible for certification. Punctuality is to be adhered to. Late walk-ins to any module or any part of the course will not be allowed. Respect for the teacher and training is paramount in the yoga tradition. Disrespect misbehavior or unwarranted talk and argument is not allowed. The teacher’s decision would be final in this regard. No guests or friends are allowed within the premises during the course of the training program, nor are they allowed to live with the student during the month of training. Smoking, consuming alcohol, and eating non-vegetarian food is strictly prohibited within the teaching and living premises. The student must not disturb the peace of the surroundings or his fellow students. In accordance with this, no kind of extra-ordinary activities may be carried out. For any kind of personal discomfort or issues, the teacher or manager may be contacted individually for redress. You observe an accommodating attitude towards everyone. Please do not indulge in psychological harm, discrimination, or a hurtful attitude. You have to maintain self-restraint and moderation by trying to adopt a middle of the road approach to eating and living. The mantra will be internalized and you will be okay. You have to hold goodness. You have to observe silence, especially during meals and do not indulge in gossip or loose talk. You have to keep yourself and your surroundings clean. You are encouraged to have a daily bath and your daily ablutions before starting the day. You are obliged to take charge of your room by keeping it clean at all times in the spirit of Karma yoga. You can ask for cleaning materials if required and available. You have to adopt an attitude of surrender and non-possessiveness. You will be here for just a few weeks and will be amazed to see how beneficial attitude of going with the flow can be for your personal growth. Disregard or non-adherence to any of the above rules may render disqualification of the student without further reason. In such cases, no fee or part thereof would be refunded. People who are 75 years old and above will have to check with Shree Mahesh Heritage about their health conditions and if required health check up and doctor report. A great scholar of Vedic Sciences who de-coded the secrets and practical approach to this age old traditional science of health, healing, well-being and self realization in very simple and effective way so that even people with modern lifestyle can follow them easily. Ram completed his first professional Yoga Education from Kaivalyadhama, India in 1992. He had delivered retreats, workshops and teaching training courses in worldwide destinations including India, Germany, France, Mauritius, and China etc. His teaching style originates from his years of study, training and self practice in many different yoga and meditation styles. He has a talent for directing people deeper into their own experience. The simple routines and hands-on solutions he gives people, improve their health-wellness and make them feel positive and happier in their daily life. He is the Director of Study Abroad Programs for Meditation and Yoga School India - Shree Mahesh Heritage and Mantra Yoga & Meditation School.A meditation teacher, Sr. Meditation TeacherAyurveda Massage Practitioner, and Detoxification Healing Therapist by profession with a Business Management degree, Sarvo brings a diverse skill-set to the team. He has extensively studied Hatha, Gyan and Bhakti Yoga and taught in India at Mantra Yoga & Meditation, Canada, Shree Mahesh Heritage & Rishikesh Vinyasa Yoga School. Dr. Harsh comes from a family of Doctors, whose Grand Father was a very famous Ayurvedacharya during 1970s. He did B.A.M.S (bachelor of ayurvedic medicine and surgery) five and half year degree course from gurukul ayurveda college Haridwar, Uttrakhand India in 2003. He carries a rich experience of over 10 years in the field of chronic disorders and their treatment through Ayurveda stream. He has been a pioneer in Rishikesh Medical fraternity and more than 20,000 patients from India and abroad have already benefitted with the help of his varied expertise and rich experience. Tomar had master degree in physical education and then completed PG diploma in yoga from Kaivalyadhama, Lonaval India in 1993. He is sharing his experience of yoga in all its various forms with global students including India. His knowledge of Hatha, Ashtanga, Tantra, Kundalini Yoga and Vedantahas been deepened by the guidance of many Indian spiritual teachers. Believing that being fully conscious of every aspect of the body in a pose prevents chatter in the mind creating focus and presence, Tomar loves guiding people to take responsibility for their own learning, development and healing. Pandit Ganesh Shastri belongs to Hindu Brahmin Family, known well for living under Vedic Lifestyle passed through their ancestors. Vedic LIfestyle Teacher He is a priest, a student of sanskrit grammer and an astrologer, practicing all this for last more than 25 years. As with all aspects of Vedic teachings, everything is interwoven and everything compliments everything else. The knowledge you receive from Ganesh Shastri supports your meditation practice and allows you to live a happy, healthy, and harmonious life. This meditation teacher training will be located in Tapovan, Rishikesh, India, the foothills of Himalaya. Rishikesh is a small town in the northern state of Uttarakhand in India and is known as the world capital of yoga. Scenically located where the Ganges River comes down from the Himalayas, Rishikesh is also the gateway to the Himalayas. The Char Dham Yatra, four shrines sacred journey, ideally begins from Rishikesh. Further north-east, there are two bridges spanning the Ganges, Ram Jhula and Lakshman Jhula at either end of these bridges are the main hubs of activity and interest. Most accommodation and restaurants can be found near Lakshman Jhula and Swarg Ashram. Rishikesh India, the birthplace of yoga, is a popular place to come and meditate, do meditation, and learn about other aspects of meditation. Rishikesh lures those seeking knowledge and peace with its numerous ashrams and yoga-meditation centers surrounded by hills on three sides and sacred river Ganga. It is particularly popular with people seeking for meditation, yoga, health, and well-being through natural means. Shree Mahesh Heritage, with its stunning mountain setting in the holy town of Rishikesh, is a wonderfully spiritual place for editation-yoga and natural healings on Vedic lineage. During this program, you will be provided three daily vegetarian meals. Consuming alcohol and non-vegetarian food are strictly prohibited within the teaching and living premises. Please book your flight to arrive at Indira Gandhi International Airport (DEL). Rishikesh is in close proximity to Dehradun Airport (DED) - a small, quiet, and recently renovated airport. The runway is being extended and will possibly then handle flights from other metros. Rishikesh being the closest city to Dehradun Airport (DED), the flight is probably the best way to travel. Rishikesh city is about 15 kilometers from the airport, around 15 to 20 minutes' drive. There are some flights from Indira Gandhi International Airport (DEL) to Dehradun Airport (DED) such as Air India 9609 at 9 a.m. on Friday, SpiceJet 2328 at 10.05 a.m., Jet Airways 2814 at 11.10 a.m., Jet Airways 307 at 1.30 p.m., and SpiceJet 2223 at 3.05 p.m. available on all days, Air India 9609 at 11.30 a.m. on Sunday, Tuesday, Thursday, and Sunday, and Air India 9609 at 1.55 p.m. on Wednesday. From Indira Gandhi International Airport (DEL) to Rishikesh by car is a good option for a hassle free traveling specially for foreign tourists who are traveling to India for the first time. It is a six to seven-hour journey. Prices vary from 85 USD for an air conditioned compact car to 125 USD for an air-conditioned SUV, but rates are much higher if one avails these services from prepaid taxi booths located at the airport. From Delhi, the city is about 230 kilometers away and is well connected with buses. A bus journey may take about five to seven hours depending on the traffic and costs you about 130 INR to 350 INR. An AC Bus will cost about 250 INR to 700 INR. In Rishikesh, there are several travel agencies scattered around Swarg Ashram and Lakshman Jhula that can book luxury buses to common destinations like Delhi, Jaipur, Agra, et cetera. Haridwar - Rishikesh 5.20 a.m.
Haridwar - Rishikesh 10.30 a.m.
Haridwar - Rishikesh 5.25 p.m.